At the Farnborough International Airshow 2012, China’s Hebei Airlines has ordered five more Embraer 190s, for delivery by the end of 2013. The five Embraer 190 jets will join two delivered to the carrier last December and in service with Hebei Airlines since January. Hebei Airlines had previously committed to take another eight Embraer 190s but required Chinese government approval for the expanded order. The July 9 deal for five is likely to be part of that planned follow-on order. Embraer values the July 9 deal at US$226 million at list price. The order announced at the Farnborough International Airshow 2012 has been registered in Embraer’s backlog for the second quarter of the year. 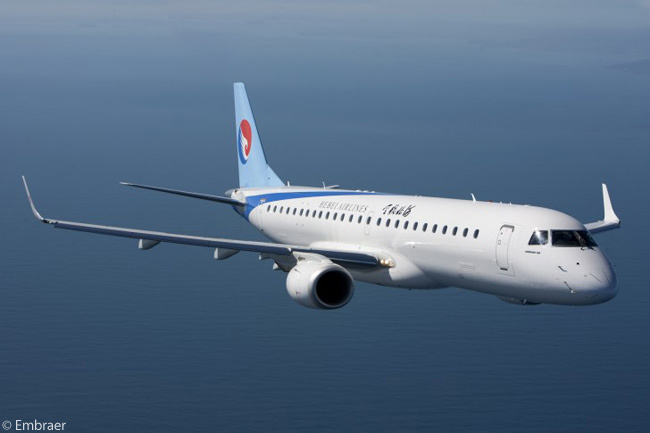 “The approval by the Chinese government for Hebei Airlines to acquire five more E190s indicates their confidence in the E-Jets’ performance and the jets’ contribution to the development of China’s aviation industry,” says Paulo Cesar Silva, Embraer’s president, Commercial Aviation. “The E-Jets are market leaders in its segment in China and recognized for their versatility and passenger appeal, and will help Hebei Airlines to expand its network by exploring new markets and adding frequencies on existing routes,” adds Silva. Based in Shijiazhuang, the capital of China’s Hebei Province, Hebei Airlines’ two existing Embraer 190s serve eight destinations with around 70 flights per week. According to Embraer, the two jets have achieved an average schedule reliability of 99.5 per cent and a 100% per cent schedule completion rate, and their daily utilization hours keep increasing. “It is exciting to have the government’s approval for five more E190s. The two jets in operation have maintained exceptional performance,” says Luo Zhanling, vice chairman & CEO of Hebei Aviation Investment Group, Hebei Airlines’ parent company. To date, Embraer has seen customers place more than 60 Embraer 190s in service in China since the jet entered this market in 2008. The manufacturer forecasts that 1,005 jets of up to 120 seats will be demanded in the Chinese market in the next 20 years. Hebei Airlines was inaugurated on June 29, 2010, and is the core affiliate of the Hebei Aviation Investment Group. Based at Shijiazhuang Zhengding International Airport (IATA code SJW), the carrier focuses mainly on carrying passengers, cargo and mail, and partially on general aviation and other services associated with air transportation. In its initial operations, the carrier has focused on regional flights within Hebei Province and to neighboring cities that can be reached by air in one to two hours. It has established four networks: an intra-province hub, a regional network, a Beijing sub-hub, and the “Bohai-rim express”. Initially known as Northeast Airlines (China) before its re-branding, Hebei Airlines also operates four Boeing 737-700s, one Boeing 737-800 and five Embraer ERJ-145 regional jets. Hebei Airlines expects its fleet to expand to 20 aircraft by the end of China’s “12th Five-Year Plan” in 2015, and to be carrying more than 3 million passengers per year at that point.